Posted 1/10/2019 9:26pm by Leslie Cooperband or Wes Jarrell. Last weekend, the sun shone so brightly and the air held traces of a false scent of spring. It was the kind of weather that lured us off of our comfy chairs and compelled us to clean; a “no excuses” kind of day so atypical of winter. My target was the chicken coop. The laying hens’ sense of hygiene and feed frugality leave a lot to be desired. The neglected floor of the coop had a layer of co-mingled waste feed, straw bedding and manure so dense and compacted; we needed a pick ax to break it loose. We collected our implements and let the hens out of their fenced yard to roam the orchard and the compost pile. They reveled in their freedom, fanning out across the dormant grass and pushing away the swirling piles of desiccated leaves. They were downright giddy with the warm weather that had softened the soil, revealing the occasional dormant grub. While they busied themselves hunting for insects, we got to work on our cleaning job. Wes broke loose the coop floor debris and pushed it out the door; I scooped it up and placed onto the cart that would take it to the compost pile. Several of the hens, concerned about the goings on in their “house” wandered back from time to time, expressing clucking concerns about the disruptive project. Once the original wood of the floor became visible, I moved inside to get to work on freeing the roosts of the hens’ nightly toilet deposits. Then, I removed the straw bedding from the nest boxes and brushed away the cobwebs around the corners of the coop. Soon, the coop’s original foot print revealed itself, and I could begin to reconstruct their basic necessities: fresh straw for the nest boxes, a skiff of straw underneath the roosts to collect their nightly deposits, fresh water and clean feed and scratch. All the while, the broody hens wandered in and out of the coop to check on my progress. As soon as the fresh straw was tucked neatly into the nest boxes, one of the red hens dove in head first and clucked with delight. Another reddish-grey gal with a mini-afro scratched away the fresh straw underneath the roost and belted out the call they make after they have laid an egg. Clearly she approved of our housekeeping standards. The other hens, intrigued by her calls, pulled themselves away from the compost pile to revel in their freshly primped digs. I know how they feel; there are few things more satisfying than a freshly cleaned house. During the winter months, the farm seems fairly quiet, but actually there’s a lot going on. The hardest working animals on the farm are our female goats, or does, which are in the middle of their 150-day gestation period. Each doe is starting to show signs of pregnancy as their bodies go into overdrive to develop the babies inside. It’s this time of the year they deserve a little pampering! Come out for “Dote on the Does” and enjoy a cup of hot chocolate or a specialty coffee drink as you meet the moms of the babies that will be born this spring. Our staff will be grooming and feeding the goats, as well as answering any questions you may have. Watch as we measure and track the girth of the does scheduled first to go (kidding season should start the first full week in March): Helena, Medusa, Periwinkle, Violet, and Zora. While you’re out at the farm, be sure to take your guess at which doe will give birth first! Pick a doe, a date and the number of kids for a chance to win a free Prairie Fruits Farm t-shirt. Then come back into the Farm Store for a cheese board and glass of wine or beer, or just to warm up in a comfy chair, as you plan your next visit to dote on your favorite doe. The farm store will have a limited repertoire of cheese for sale, as well as other products (meats, eggs, sausages, locally milled flour, honey, jam, PFF& C “merch” and more! Dates are every two weeks, starting this weekend, 1/12-13 through the end of February. Farm Store Hours 11am – 3pm. Follow directions to our farm on our website. Please note that it is NOW easier than ever to get to the farm, even in bad weather—North Lincoln Ave and Olympian Drive Eastward are brand new roads, maintained by the city of Urbana during inclement winter weather. Pelota Roja: The piquant Manchego style cheese with a guajillo-chile rub on the rind—this is the cheese we make for Rick Bayless’ restaurants-Frontera Grill-Topolobampa-Leña Brava. It is perfect grated over scrambled eggs or a winter frittata. We will also have these cheeses available for sale in our farm store during the open hours this weekend: Saturday and Sunday, 11 AM to 3 PM. If you’re looking for exceptionally healthy, American-Dairy-Goat-Association-registerable breeding stock (doelings and bucklings) or just a great pet/companion, consider reserving a kid or more through our website. Our kidding season will start in mid- March, and prices vary by age. Prairie Fruits Farm is HIRING! 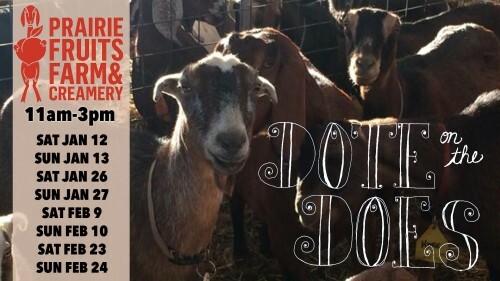 Prairie Fruits Farm & Creamery, LCC is an artisan farmstead goat dairy and creamery located in Champaign, Illinois. This award-winning creamery, established in 2005, is looking for a new cheesemaker to manage the production of the current line of products (cheese and gelato). We are looking for a candidate who would love to be part of a small artisan operation and help to further develop the company with increasing production volumes, developing new products, and improving the overall profitability of the operation. The ideal person has 2 to 5 years of experience with cheese making and understands what it takes to produce dairy products safely in a small, family-owned farmstead operation. In addition to cheese-making, the production manager would be responsible for making gelato base, flavoring and spinning gelato, managing cheese and gelato inventory, managing wholesale accounts, supervising other cheeserie employees and maintaining all relevant records related to production and food safety compliance. As time permits, the ideal candidate could also is participate in other farm activities, such as marketing and promotion, goat milking and agri-tourism, etc. The new cheesemaker will receive initial training by the owners, and will gradually take over management-level duties when trained. We also encourage those who aspire to a career as a cheesemaker and/or working for an artisan company to apply if they have significant experience in similar fields (culinary, food science, production of fermented foods/beverages) and have a clear motivation to follow this career path for the long-run. The candidate must have an eye for detail, excellent organizational skills, impeccable sense of hygiene, ability to be on his/her feet for 8-10 hours/day, ability to lift 50 lbs. or more and an ability to work independently and with a small team (2-3 people). The company is offering a competitive salary with benefits which will depend on the quality and experience of the candidate. For more information about Prairie Fruits Farm & Creamery, visit our website or Facebook page. Feeding shifts are 7-8 AM, 12-1 PM and 4:30-5:30 PM, 7 days a week from mid-March through mid-May. Copyright 2019. Prairie Fruits Farm & Creamery, LLC. 2019. All rights reserved. 4410 N. Lincoln Ave., Champaign, Illinois 61822 Prairie Fruits Farm & Creamery, LLC is responsible for the content of this email. Please contact Leslie Cooperband or Wes Jarrell with any inquiries. Copyright 2018. Prairie Fruits Farm & Creamery, LLC. 2018. All rights reserved. 4410 N. Lincoln Ave., Champaign, Illinois 61822. Please contact Leslie Cooperband or Wes Jarrell with any inquiries.